Academician Alexey Kuzmich Rebrov is a great scientist in the field of physical gas dynamics, the dynamics of dilute gases, in thermophysics, and vacuum engineering. For more than 40 years, A.K.Rebrov is a scientific associate in the S.S.Kutateladze Institute of thermophysics of SB RAS. Since 2004, Alexey Kuzmich is an adviser of the Russian Academy of Science (the Institute of thermophysics of SB RAS). He made a significant contribution to recognizing the regularities of transport processes in dilute gases, to the research of gas dynamics of low-density jets, to studying the processes of relaxation, condensation, and irradiation within non-equilibrium gas flows, to the development of the technique of electron-beam diagnostics of low-density gas flows. His widely known works include those on heat exchange with free convection in a dilute gas, on thermal justification of "Saturn" astrophysical observatory, on the structure of low-density jets, on physics of relaxation processes during the expansion of gases in vacuum, on gas dynamics of super high-vacuum vapour-steam pumps, and on physics of clusters. 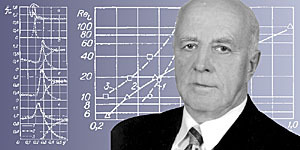 Alexey Kuzmich has created the USSR-largest vacuum gas-dynamic complex that is equipped with modern-day diagnostic facilities and that made it possible to complete a priority research of non-equilibrium supersonic jet currents with effects of translational, rotational, and oscillatory relaxation, spontaneous condensation, and radiation. The scientist conducts applied researches into gas dynamics of space vehicles and orbital stations, and into the development of resource-recovery super high-vacuum vapour-steam pumps. The scientific school of A.K.Rebrov is famous in our country and abroad. 32 candidates of sciences have been prepared under his supervision, 12 of them became doctors of sciences, and one became the corresponding member of RAN. A.K.Rebrov's combines to advantage his research work with teaching: he was the professor of Novosibirsk state university for a long time, and he headed the NSU sub-faculty of physics of non-equilibrium processes from 1998 to 2004. Scientific-and-organizational activity of A.K.Rebrov is of many-sided nature. He plays a pivot part in the organization and in carrying out of All-Russia and international conferences on the dynamics of dilute gases. Academician A.K.Rebrov is a member of the International consultative committee of symposiums on the dynamics of dilute gases, of Scientific Council on vacuum science and technology of the Russian Federation, of the Russian national committee on theoretical and applied mechanics, of European hypersound association; he is a member of editorial boards of the following magazines: "Applied mechanics and technical physics", "Vacuum technique and technology", "Energy"; he holds fruitful cooperation with "Thermophysics and aeromechanics" magazine. Scientific, pedagogical, and public work of academician A.K.Rebrov has been rewarded with high state awards, with the Order of Friendship, and medals. * Sources: 1) K 70-lyetiyu Alyeksyeya Kuz'micha Ryebrova // Tyeplofizika i aehromyekhanika. - 2003. - T.10. - N 3. - S.485-486. 2) Akadyemiku A.K.Ryebrovu - 70 lyet // Vyestnik RAN. - 2004. - T.74. - N 2. - S.181. Dokumyent izmyenyen: Wed Feb 27 14:46:42 2019. Razmyer: 8,633 bytes.